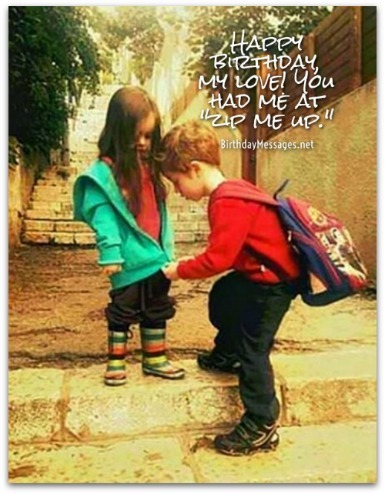 Romantic birthday wishes, when done right, are the best way to express your feelings to the one you love. Romantic birthday messages come in many sizes — from a short "I love you" to a never-ending love birthday wish — but only in one shape: heart-shaped. The right kind capture how you feel in your heart about your special someone. 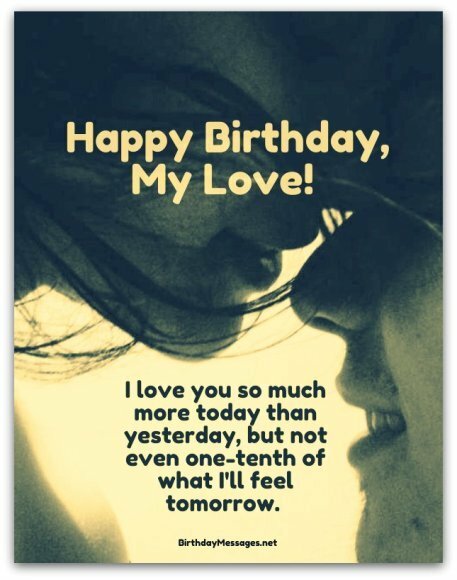 Find just the right love birthday messages on this page, making it easier than ever to tell someone special how much you love them. 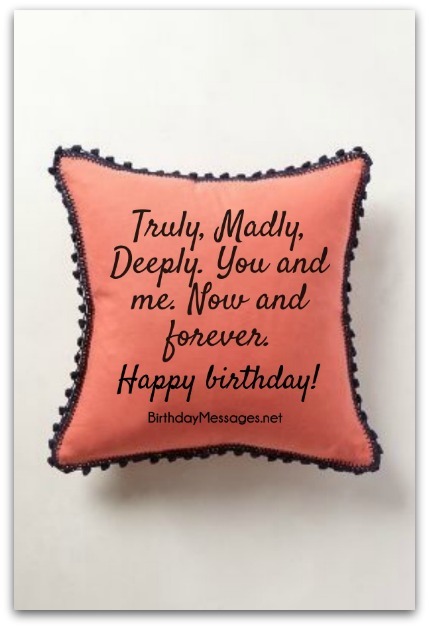 If you want to give your husband, wife, girlfriend or boyfriend the perfect birthday wish, there's really nothing better than birthday wishes with lots of romance thrown in. Done properly, love birthday messages can actually make your significant other’s heart flutter. Done perfectly, you can also sweep your lover off her or his feet. That's when you know you chose just the right birthday wish. 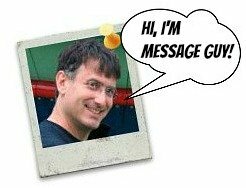 What's the wrong type of romantic birthday greeting? It's easy to fall into one of these traps, if you don't know your significant other too well. If this is the case with your relationship, go the generic birthday greeting route (just check out my "Happy Birthday Wishes" section). Otherwise, get started with one of the romantic birthday wishes below. Pick the one that says everything you want to express...and go from there, keeping what you choose "as is" or changing it a bit. My day doesn't start with sunrise and end with sunset. It starts and ends with you, my love. You're my morning, noon and night. May your birthday start and end with the afterglow of our fiery love. I adore everything about you, from your sparkling eyes and stunning smile to your tender, loving heart and soul — doubly so on your special day. Happy birthday! The day you came into this world was, even if I did not know it at the time, the first day of my long journey to you. This is truly a special day. Happy birthday! I love you more with every step we take together to parts unknown. I could never have dreamed you. You are every fantasy I've ever had, rolled up into the loveliest of creatures. May your birthday be as extraordinary as you are. On your special day, let's lock the doors, pull down the shades and lose ourselves like the fools in love we are. Sweetie, happy birthday! Every day, I thank my lucky stars that you're mine and I'm yours. Without you, there would just be a big hole in my life that could never be filled by anybody else. 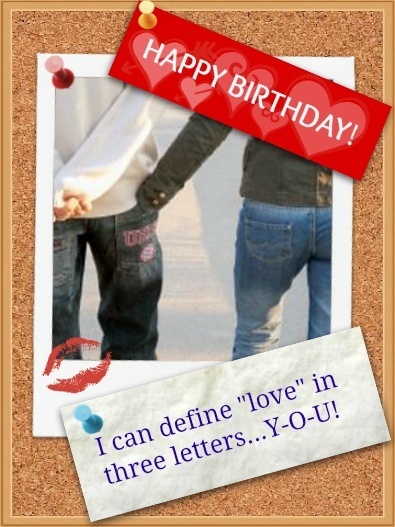 You are the greatest gift in my life, so I want give you the greatest gift of all for your special day: my undying love. Happy birthday, my dearest! Happy birthday, lover. You cannot imagine how happy I am we can spend your special day together. Let me show you! I love you so much more today than yesterday, but not even one-tenth of what I'll feel tomorrow. Happy birthday, my love! For me, there's nothing better than sharing this special day with my favorite person: you. Happy birthday, my love! Your birthday is the only day of the year I enjoy as much as mine. That's because I love you more than I love myself. Happy birthday, my precious love. Happy birthday, my dearest! Today, there's no greater love than mine for you. Tomorrow, this will no longer be true. Then, I will love you even more! Happy birthday, darling! Our love is reckless and stupid. That's just the way I like it. The romantic birthday wish right below hits the right note for me for a simple reason. These are my top picks because each romantic birthday message goes right to the heart of the matter: how deeply in love you are with your lover. Give this message to your husband, wife, boyfriend or girlfriend...and watch their smile (and heart) grow bigger and bigger by the second! You're not just one thing to me. You're everything...and then some! Happy birthday, my darling! If anybody ever asked me to define what "love" is all about, I could answer that question in three letters: Y-O-U! I love you so much! Happy birthday, darling! It's true what they say: all you need is love. I'm just lucky that I have you as my love. Happy birthday, my dearest. Your search has just begun! Sending you all my love on your birthday to keep your heart warm the whole year through. Happy birthday, my dearest! I know it takes less than a split second to say I love you. That's why I plan to spend my entire life showing you just how much. Happy birthday, lover! Today, you will receive many greetings for your birthday, from many well wishers, so this one comes with something extra: my everlasting love. Happy birthday, dearest! On your special day and every other day of the year, my absolute favorite place to be is right by you. Happy birthday, baby! The easiest thing I ever did was not falling in love with you. It’s been staying in love with you ever since. Happy birthday! I love you. It must have been incredibly sunny the day you were born — because you've brought only sunshine and warmth into my life ever since I met you. Happy birthday, hottie! Luck has always been on my side, but I've never been luckier than when I met you. I'm the world's luckiest person...with somebody as amazing as you to love. Happy birthday! When we're together, an hour feels like a minute. When we're apart, a minute feels like an hour. Let's have the time of our lives on your birthday. Happy birthday, darling! If I could, I would hand you all the stars in the sky on a silver platter as your gift. But I can't, so I will give you my love to keep for eternity. Want to be even more romantic? You're just one click away from 50 simple ways to be romantic. Add one or more of these ideas to your romantic birthday wish (from this site) and make your lover's birthday more romantic than ever. Interested? Click here to check out these great tips.